It’s the end of 2010 and my friend Kelley and I are reminiscing on how insane that year had been (concert wise… and I guess life wise as well). The entirety of summer/fall we had at least one concert a week, sometimes up to five a week. We’d seen great shows at tiny venues by bands who no one had heard of yet, all the way to seeing Elton John perform for thousands (dream come true by the way). Kelley and I felt lucky. Lucky to have been able to see so many amazing shows. Lucky for seeing many of them for free. Lucky to spend our time doing the thing that we loved most, surrounding ourselves in music. We were driving home from one of the last shows that year when we decided not to let this luck run out. A list was made. 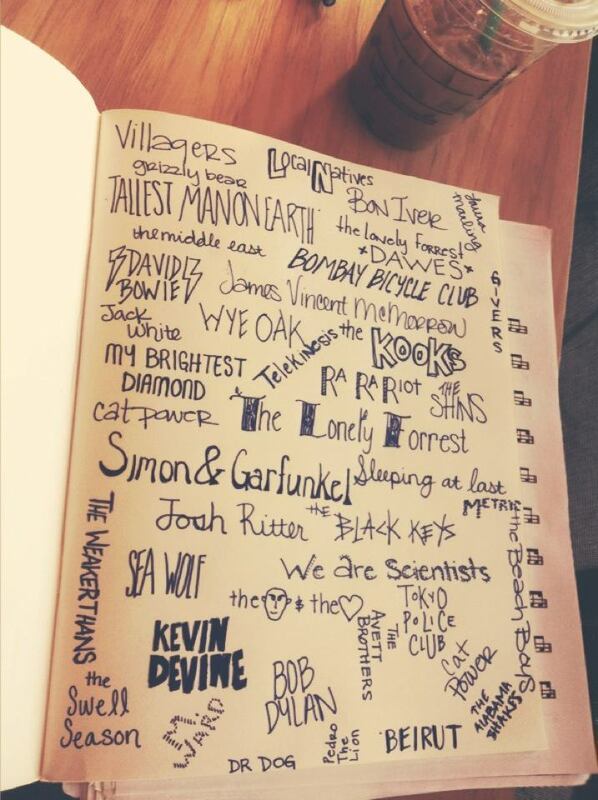 Kelley and I started naming all the bands we dreamed of seeing in the next year, outloud… in the car. We threw these out into the universe hoping she would hear us but figuring it was a long shot. Slowly, one by one, they each scheduled shows. I think it was when Arcade Fire announced a show (in Houston) with explosions in the sky that we knew we really did have magical powers. Radiohead and Andrew Bird both have shows in March and now we are certain we are wizards. Some people think we are silly. My mother has asked me to use my magical powers for something more useful (like to say finish school and find a job worthy of my wizardly talents). I tend to shrug off these remarks, knowing that they just havent experienced what I have, their heart doesn’t beat to the same drummer that mine does (namely Scott Avett’s kick drum). There is this ridiculous moment of anticipation when the lights go dark as your favorite band takes the stage. I remember being so surprised at the lump growing in my throat right before Arcade Fire came out (I don’t want to even think about how I’m going to feel waiting for Radiohead). How about that moment when you hear the song that you’ve held so dear for soooo long? Finding my eyes welling with tears when Sufjan played Casimir Pulaski Day (a song that had lived in my car/headphones/room/heart for so many years). But let’s forget the emotional aspects of it, let’s get down to a show at it’s core… the energy… There is something so pure about dancing and singing en masse. Maybe it comes from all my years in church, singing the worship songs and hymns together. Connecting with a room of strangers through the words you are all singing, through the words you all believe. When Dawes sings “When my time comes” it’s a hymn. It’s an exclamation and a mantra. There is no one left silent or still during that song because it’s something we all feel and believe in. Or how about just feeding off the energy of the band, the guitars reeling, the drums pounding so hard you can feel it in your bones and it feels as if your heartbeat is calibrating itself to the new rhythm. Maybe like when Keith from We are Scientists jumps off stage to dance with you to one of your favorite songs (or was that just me?). The best lead singers are like street preachers, pulling you in, absorbing you in their tales, all shouting and urgent, every word life or death. These are the moments that I feel most alive and at home. And then there’s the practice of seeing bands you’ve never even heard of before. I love getting to a show a little early to catch an opening act or two because every so often they blow you away (I’m looking at you Villagers) and sometimes they even become your new favorite (ahem, The Head and the Heart). My list for this year (yes I’m getting to that) is comprised of so many bands that I heard of/saw for the first time last year while opening up for other bands. So here it is, my new list. Compiled with Kelley at the very beginning of the year over some Kerbey Lane. We are putting it out into the universe and praying for the best. More than anything we just want to continue to flood our lives (waist deep) in music, whether we complete this list or not doesn’t really matter. Who are YOU putting on your list this year? I have ALWAYS loved Valentines day! Whether it was as a child, passing out valentines and deciding which boys cards would be signed Love Ya, and which boys got Love Ya Lots. Or when I was working at a grocery store and would watch the valentines displays be carefully built and then watch as the men would flood the store and stare at the display in complete confusion, wondering which teddy bear/flowers/candy would say the right thing to their significant other (p.s. adult women don’t really NEED teddy bears). I’ve always loved this day, call me a romantic but really I just enjoy a bit of whimsy. (I even bought Justin Beiber valentines for my coworkers this year!) I made a little Valentines Mix to celebrate the day (it’s in the link above). Hope you enjoy it, and hope today is filled with love… and whimsy. This is something I’ve been meaning to do for quite some time now, since it was called a zine/xanga/podcast/blog. So I’m finally putting the pen to paper, the fingers to keys, the nose to the grindstone. I will attempt to be diligent, I will attempt to be consistent, I will attempt to bring you something new. I am aware that the world is full of girls like me (nerdy, music obsessed, clumsy, and loud mouthed) I am aware that this blog probably has hundreds of other names out there… That in mind, I will try my darndest to make this interesting.